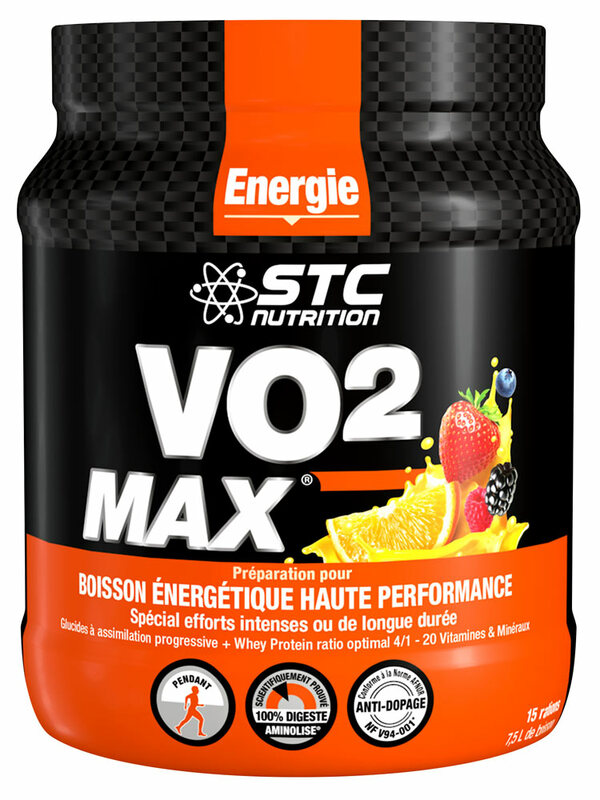 STC Nutrition VO2 MAX is a high carbohydrates and enriched in vitamins A - B1 - B2 - B3 - B5 - B6 - B8 - B9 - B12 - C - E energy sports drink mix, Orange (OR) or Red fruits (FR)flavoured. 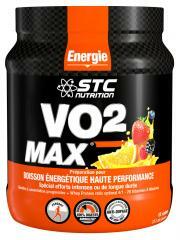 - To naturally improve the performances and the muscular endurance. - To accelerate recovery by optimizing glycogen stocks rebuilding. Aminolise (Exclusive scientific innovation STC Nutrition) is a naturally derived active ingredient associating bifidogen fibres, lactic ferments, digestive enzymes and proteolytic enzymes, which significantly improves protein absorption by helping the digestive process, essential to the release of the amino acids contained in proteins. Aminolise improves reduction of some of the common side effects of high protein dieting like occasional bloating, gas, constipation and indigestion. 1 box = up to 7.5 L of drink. Mix 30 g (2 scoops) in 500 ml water (or 3 if ambient temperature <25°C and 4 is <10°C. To shake well until complete dissolution, then to consume during the effort by small mouthfuls each 10-15 minutes (at a rate of approximately 500 ml per hour) and then 500 ml immediately at the end of exercise. Indication: Compensate for the vitamin and mineral losses, naturally improve the performances and stamina, accelerate recovery. Maltodextrines, Protéines de Lactosérum (Lait), Fructose (OR, FR), Aminolise 5% (Fructo-Oligosaccharides - Extrait de Riz Fermenté Riche en Amylase, Protéase, Lactase, Lipase, Cellulase (Aspergillus Oryzae), Ferments Lactiques : Lactibacillus Caséi, Lactobacillus Acidophilus, Lactococcus Lactis, Bifidobacterium Bifidum ; Extrait de Papaye riche en Papaïne, Extrait d'Ananas riche en Bromelaïne, Arôme, Chlorure de Sodium, Phosphate de Potassium, Colorants Naturels: Bétacarotèn(e) (OR) ou Jus de Betterave (FR), Phosphate de Potassium, Extrait de Gingembre, Extrait de Citron Riche en Bioflavonoïdes, Chlorure de Potassium, Vitamine C, Oxyde de Magnésium, Phosphate de Calcium, Vitamine E, Citrate de Potassium, Molybdate de Sodium, Vitamines PP - A - B5 - B6 - B2 - B1 - B12, Anti-Agglomérant: Silice Gluconate de Manganèse, Gluconate de Cuivre, Guconate de Zinc, Sélénite de Sodium, Vitamines B9-B8, Chlorure de Chrome.